When you're looking for disposable gloves, it's important to consider how easy they are to apply and remove. This is particularly true if you often have to perform emergency examinations or examinations under pressure. 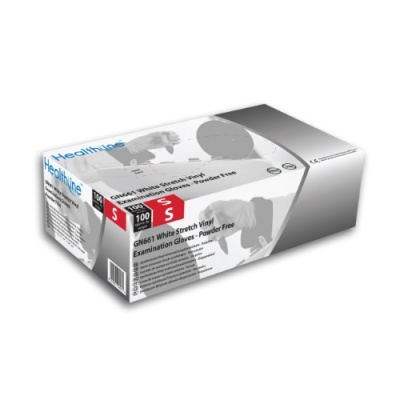 When this is the case, the Healthline GN661 White Stretch Vinyl Examination Gloves (Pack of 100) are ideal for you. Designed with a beaded cuff for easier application and removal, these gloves are an excellent alternative to latex gloves. This test measures the extent to which a glove is safe to come into contact with food. With the exception of fatty foods, the Healthline Examination Gloves are suitable for this purpose. The GN661 Examination Gloves are available in five sizes. Please measure your hand across the widest part of your palm and refer to the sizing table below to find out which size will fit you best.